We specialise in working with schools, individuals and community/conservation/environmental groups to create living willow structures that enhance parks, school grounds and gardens. We have been working in schools for over 10 years and have full Public Liability Insurance and Enhanced CRB clearance. We have worked with Surestart Projects, Brownie Groups and Countryside Live. We also work to commission for private projects and can create unique and durable living structures for play, shelter or habitat. Willow can be woven into many different shapes that can be decorative and useful. 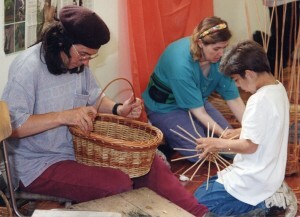 Basketmaking is an ancient craft that turn a bunch of sticks into a useful and beautiful container. Sculptures can be created out of dried willow that has been soaked in water to make it pliable. We make all manner of willow sculptures ranging from small animals to large outdoor installations. Live willow rods can be planted to make all kinds of living willow shapes and structures. Garden development can involve creating areas of biodiversity, playground features and sculpture trails. We plant a range of different willow varieties chosen for each project for their hardiness, growth, colour and suitability. 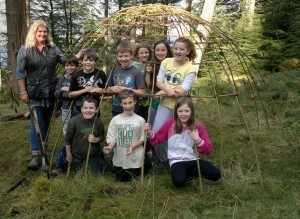 Our projects have included domes and tunnels for ‘living shade’, mazes, shelters, windbreaks, birdhides and fencing. We can also incorporate willow plantings and structures into sensory gardens and wildlife areas. 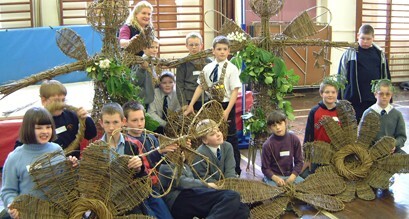 History projects can involve willow weaving in various forms from simple basketmaking to building wattle hurdles. Arts projects can also involve willow weaving from small individual freeform sculptures to large group projects creating installations. 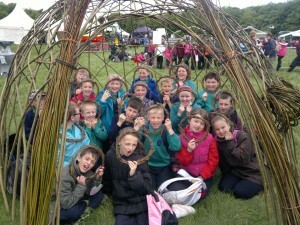 Willow days can be themed around a particular study topic such as the environment, marine life, myths & legends etc. Children have created birds, butterflies, fish and monsters in recent projects. 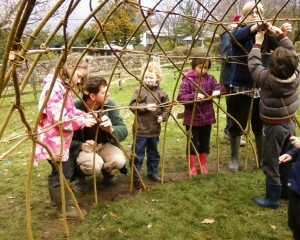 We encourage children to develop their own ideas using willow and other recycled and art materials. Reading Trees are popular now. Children help to weave them and the woven trees are installed in classrooms to inspire literacy. We can work with small groups on one day arts projects or larger numbers of children over longer residencies such as Arts Weeks. We can work with all age ranges, adapting projects for differing abilities and objectives.